I have to admit, the game manager Lutris [Official Site] has come along quite a bit since I last used it. Today, version 0.4.20 was made available. 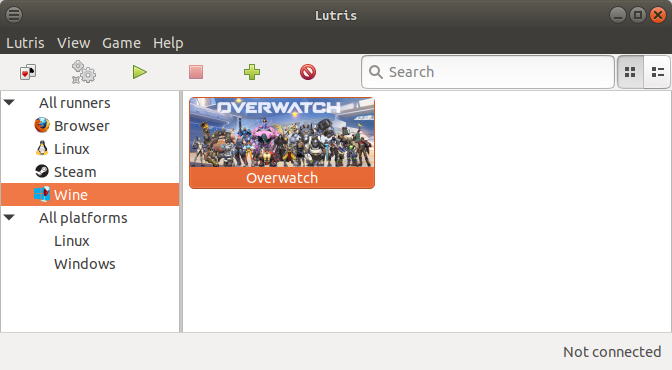 For those not aware of it, Lutris is an application that aims to give you a single place to manage all your games on Linux. It supports native games, Wine, various emulators and so on. The application itself is available under the GPL and the helper scripts to install games can be viewed before using them so it's quite nice. Truthfully, I've not always had a great experience with Lutris. The interface needs a lot of work to make it more friendly, but once you tame it there's a lot of possibilities. Keen to see what it had to offer, Humble Bundle recently sent over a copy of the latest Humble Monthly which includes Overwatch. Since I wanted to finally see what all the fuss is about (and have a good test-case for DXVK), I decided to use Lutris. Thanks to Lutris having scripts to do basically everything for me (like this), after little fuss I had Overwatch installed and running with Wine plus DXVK setup for me. I did come across an issue with Battle.net, with the install button on Overwatch doing nothing which was fixed by removing the "C:\ProgramData\Battle.net" folder inside the location where it installed Overwatch and then restarting it. Obviously adjusting for your own resolution. The initial first 30 minutes or so had a huge amount of stutter (you can probably overcome this doing training or something), but once a cache has been built up Overwatch has run really quite smoothly just like any other native game. Very impressed with Lutris together with Wine and DXVK. I know its name, but i never really wanted to try it. Not sure i want more now, but it's good to have some more vision about what it is for. So far my experience consists of 3 games with Wine and one for N64. The Fortnite install (when it still worked) was relatively painless. I was missing some 32 bit dependencies that were available in the Steam runtime and I simply used the system options to add those directories to the library path. Overwatch was a bit more troublesome since it wasn't clear at all what it actually wanted. I ended up installing a fresh wine-staging with all suggested dependencies (which is an enormous amount of 32 bit libraries). After that it worked although I too needed to delete the files in the directory Liam mentioned to get it to install. Overwatch has another problem in that it will absolutely not work properly if you display or Window is anything other than a 16:9 aspect ratio. The game will letterbox the window/screen, but Wine messes up the mouse when it does that. Lutris seems to work pretty well. I installed my old copy of Guild Wars 2 over the weekend and am getting great performance. Diablo 3 works OK, but there's a bug somewhere that's preventing me from running it with DXVK (the Battle.net launcher gives me an error, and I can't proceed), so the performance is a bit janky, but it's otherwise playable. I haven't installed a whole lot else, but so far, I prefer it to Play on Linux because it's more configurable, and the install scripts are more up to date. Overwatch DXVK worked well for me too, it's a very well optimized game! I have far below even minimum specs and after building up my chache it runs really well (on super potato settings obv, but still). Blaze it with the new release. Does it support proton now? Patola Does it support proton now? No, but you can use a newer version of DXVK with it. A much newer one, in fact. It doesn't need to. Steam games appear if you let them, including Proton installed games. buenaventura Overwatch DXVK worked well for me too, it's a very well optimized game! Overwatch just has far too many different shaders, which causes the stutter. I'm hoping that the state cache will alleviate that problem for players in the future, because this is the one thing they have always been (rightfully) complaining about.